Serre Road No.1 Cemetery, Pas de Calais. Killed in action at Beaumont Hamel , aged 22 years. Roll of Honour. 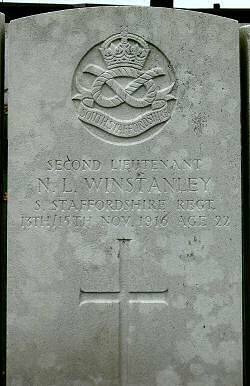 We regret to learn that 2nd Lieutenant N L Winstanley of the South Staffordshire Regiment, who was previously reported missing has now been reported as killed. 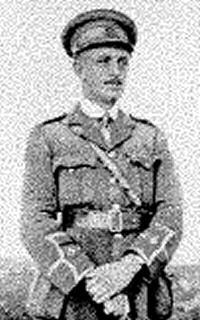 Yesterday Mr Winstanley of Beaumont received a telegram from the War Office to the following effect "Deeply regret to inform you that 2nd Lieutenant N L Winstanley, South Staffordshire Regiment, previously reported missing is now reported as having been killed in action between 13/15 November. The Army Council expresses sympathy. Secretary of the War Office". The deceased was an Old Victorian, having been at College between 1906-11, he also served in the OTC and subsequently entered the service of Parr's Bank, which he left to join the forces shortly after the outbreak of war. To the bereaved parents of the deceased officer we tender our sincerest sympathy. Lieutenant N L Winstanley reported Missing. The following telegram was received this morning by Mr N R Winstanley of Heathcot, Beaumont, "Regret to inform you that 2nd Lieutenant N L Winstanley South Staffordshire Regiment is reported missing between 13/15 November. This does not necessarily mean that he is either killed or wounded. Further news wired if received. Secretary War Office". We earnestly trust that news of the young officers safety will shortly be forthcoming.